How Does the New Chip Card Protect My Information? If you’ve gotten a new credit or debit card recently, you may have noticed a new small metallic square on one side. This is an EMV chip, a computer microchip that’s making your credit card transactions more secure. EMV chip cards work a little differently from the credit cards you’re used to swiping, but the additional security is worth adjusting to something new. If you aren’t familiar with the new cards yet or if you are curious about the change, we’ve got the information you need to understand what the EMV chip is, why it’s there, and how it’s keeping your information safe. You might hear credit or debit cards with an EMV chip referred to as one of several things, including a chip card, smart card, EMV card, EMV chip card, smart chip card, or EMV smart card. EMV stands for Europay, MasterCard, and Visa, which are the three companies that developed this security standard for credit card transactions. EMV chips are microchips embedded into standard credit and debit cards and they protect the card information. The magnetic stripe on a traditional credit or debit card contains unchanging information about the card, so if someone steals the information from a magnetic stripe swipe, they could replicate that information over and over to make fraudulent charges. 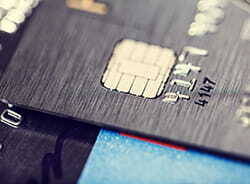 An EMV-enabled chip card, however, creates a unique, one-time transaction code every time it is used, like a one-time password that can’t be used again. This makes it much more difficult for the card information to be counterfeited. Just like magnetic-stripe cards, EMV cards are processed in two steps: reading the card and verifying the information (usually through a signature or PIN). The difference is that instead of swiping an EMV card as the first step, you insert or “dip” them into a card reader. It takes longer than you’re used to with swiping a card, but as the technology improves, the waiting time will likely decrease. For now, be patient as your chip card “talks” back and forth with the EMV reader and follow the prompts on the payment terminal screen to complete the transaction. Your EMV card will also have a magnetic stripe on the back that can be swiped just like normal if the store or kiosk doesn’t have an EMV chip reader. If you try swiping your card at a chip-enabled terminal, you’ll be prompted to insert the card instead, so you never have to worry about doing it wrong. You can use your card for online or over-the-phone payments as usual as well. However, it should be noted that these methods do not have the same level security as the EMV chip so your transaction will not be any more secure than if you used a current magnetic stripe card. Do I need a PIN or signature? Step two of using a credit or debit card, including the new EMV chip cards, is verifying the information through a PIN or signature. Chip and PIN cards are more secure because they require a PIN that would have to be stolen versus a signature that could more easily be forged. However, chip and signature cards present consumers with the familiar process of signing their receipts (either the hard copy or digitally) and don’t require them to remember an assigned PIN, so most card issuers are sending out chip and signature cards in order to facilitate a smoother transition. Debit cards with the new chip will most likely have a PIN and if it’s a replacement debit card, the PIN should be the same as before. However, be aware that some retailers aren’t equipped to read debit cards yet and so may run your card as credit transaction without requiring the PIN to be entered. Expect your experience to vary from store to store while this transition is in process. Most companies are replacing debit and credit cards with chip cards as they expire, but you don’t have to wait, especially if your cards don’t expire for a year or two. You can request a new card from your bank or credit card company at any time, usually without any extra fees though each institution will be different. How does it protect my information? The EMV microchip uses high-level cryptographic algorithms to protect your information in two ways. First, when you use the card, it encrypts all of the transaction information—your name, card number, the time and date, the store information—with a unique encryption key, making it nearly impossible to hack the transaction and steal your information in the first place. Second, because a unique key is used for every transaction, even if the information is stolen, the thieves wouldn’t be able to use it again. EMV technology will not prevent data breaches from happening, but it will make a data breach much less profitable and less attractive to identity thieves. Credit card fraud in the United States has increased over the last several years and accounts for almost half of all card fraud in the world, even though less than 25% of credit card transactions take place in the U.S. This “new” technology has actually been around for more than two decades, and in fact, nearly every major market in the world except the U.S. made the switch years ago. Credit card fraud has significantly decreased in countries that have the EMV system in place, saving them millions of dollars each year. It’s taken the United States longer to implement the new system mainly because of the steep cost of installing EMV chip readers at every payment transaction point. The other reason for the change is that there’s been a shift in who is responsible for paying for fraudulent credit card charges. Previously, if a credit or debit card was stolen and purchases were made on it, the credit card company or bank would have had to cover those charges. As of October 1, 2015, that’s no longer the case. In order to speed up the transition to chip cards, the four major credit card companies in the U.S. (Visa, MasterCard, American Express, and Discover) created a deadline for retailers to update their payment transaction terminals to accept EMV chip cards. Once that deadline passed, whichever party in a payment transaction has the lesser technology (in other words, does not provide EMV-enabled technology) will be accountable for any fraudulent charges. So if a counterfeit credit card is used to make a transaction at a store that doesn’t have a chip reader, the store will be held liable for the fraudulent charges instead of the card issuer, and vice versa if the store has a chip reader but the customer hasn’t been issued a chip card yet. Does that mean most retailers have chip readers now? In addition to replacing all credit and debit cards with EMV chip cards, the other part of this transition process is updating or replacing transaction terminals, which is a costly and slow-moving process. 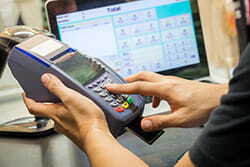 Even after purchasing and installing the new chip reading equipment, retailers must also go through a certification process that has to be completed before the equipment can be turned on, which has created some additional delays and is why you may see chip readers in stores but be unable to use them. 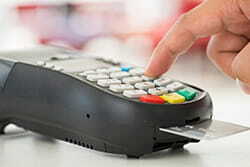 In spite of the recent deadline, only around 50% of merchants in the U.S. have installed chip-reading terminals. The numbers are lower than were originally projected by this point but they are growing, and in the meantime, you can still use your chip card by swiping it whenever you need to, though you won’t be able to benefit from the added security of using a chip reader. Whether you have an EMV-enabled chip card in your wallet already or you’re still waiting for one, everyone will eventually be using them in place of the current magnetic stripe-only cards. While the transition over to EMV-enabled card readers is slow, you can still use a chip card by swiping it or for online or over-the-phone transactions. In spite of the limited availability of EMV terminals, the chip is a significantly more secure system for using credit and debit cards in stores, and reduced credit card fraud in the countries where it has already been implemented. Be sure to watch for your new cards (if you haven’t already received them) and look forward to more and more opportunities to “dip” them over the next few years. Have you received a new chip card yet? Tell us what your experiences have been in the comments below.